To feel good is to be happy and satisfied . . even elated. And sometimes, in our lives we find that we need a little boost in this feelgood department. And so it is with our friends. Flowers are often the perfect tonic to lift someone's spirits, and this lovely colourful flower scarf may be just the answer. A feel-good gift is intended to boost a friend or loved-one's level of happiness - especially if they are feeling a bit down. 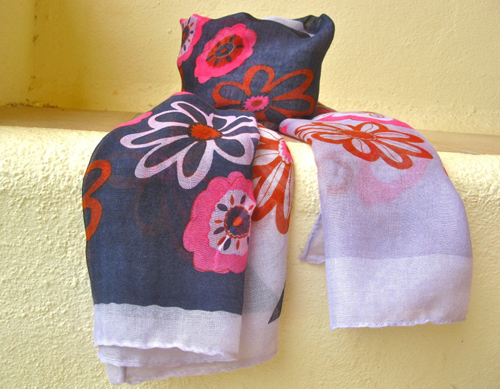 What better way than by sending this gorgeous scarf with big bold daisies and abstract flowers. It can act as a 'pick-you-up' and really lift their spirits. Of course, a feel-good gift can be given for a special event such as a Birthday, Anniversary, Christmas, etc, but also any day just to lift someone's mood and let them know you care - mother, wife, girlfriend, aunt, etc, or simply a good friend or colleague. Our lovely daisy flower scarf is a truly inspirational gift, full of spiritual meaning. Comes gift-wrapped, like all our presents (with an information card) - and we can print a personal message on your behalf.